In the fashion world, we can sometimes get so caught up in mixing colors, prints, and patterns that we lose the subtlety and class of true style. The all-white look, whether in winter, spring, or summer, brings the right amount of freshness to each season while staying current with appropriate pieces. For now, we can focus this with white jeans and a t-shirt (we all have those! ), or try a short-suit like shown above. I also love the full length A-line which brings some old glamour with it. For a look that stands out, without being fussy, go for all white. If that’s a little too bold, pair two white items with one neutral to get a similar effect. 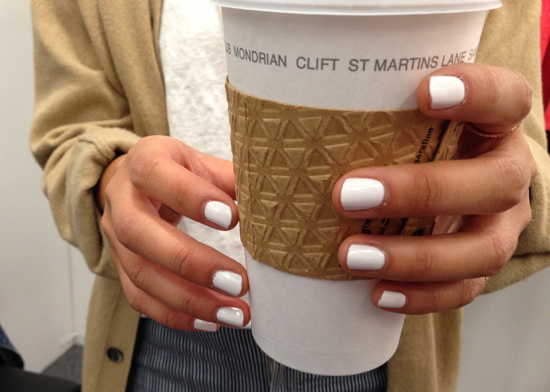 Or if you want to go with a trendy look, test out white nails (I know this is on my list to try).